Barely a press conference or TV debate goes by when the deficit isn’t brought up. Unfortunately, when politicians say that they are reducing, or aim to reduce, the deficit, what many people hear is that they are reducing the national debt. This is not the case. Talking to people particularly since the leader’s debate, it has become clear to me that this misunderstanding isn’t uncommon. Seemingly, economics is one area people don’t investigate for themselves, but rather stick to what politicians say or imply to be true. For clarification, the deficit is the difference between what the government receives in tax and what it spends. The national debt is the accumulation of past borrowing. The national debt rises with interest payments and new public sector borrowing. Below, I have nabbed fellow Gerald Steele’s lecture slide to give you an idea of the difference in size of the two. Politicians on all sides are similarly guilty. The simple truth is the national debt is rising and it is a complete fallacy to profess otherwise. As demonstrated by the graph below, in 2010, when the coalition came to power, government debt stood at 67.1% of GDP. In 2014, this figure raised to 90.6% of GDP. 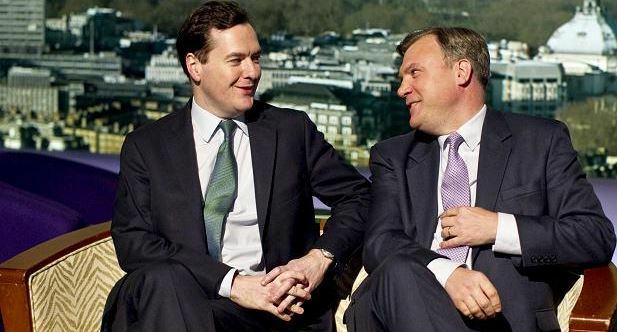 Early on, the coalition declared they would reduce the deficit by a third. Stephanie Flanders, Chief Market Strategist for UK and Europe at J P Morgan Asset Management, discussing this point in an address given to the Royal Economics Society, said “depending on what your standards are, reducing the deficit by a third is not necessarily that impressive….You wouldn’t necessarily think that you would brag about it consistently”. More recently, Professor Simon Wren Lewis of the University of Oxford noted how “the idea that in 2010 we were in a deep hole because of the deficit is just fantasy macroeconomics. It replaces something real (a financial crisis and deep recession) with something of little immediate consequence”.